Imagine yourself living in an upscale seaside resort town of about 20,000 people, with a scenic mountain as a backdrop. The mountain, as it so happens, is an active volcano. On a day in August the volcano erupts with unexpected fury and, in a short time, the town is covered underneath layers of volcanic ash and pumice. A few of the residents of the town are able to escape, but most of them die. But that’s not the end of the story. The remarkable part is that the town, buried underneath all that muck, was all but forgotten until it was accidentally discovered about 1700 years later and became the archaeological find of the age. We’re talking, of course, about the fabled Italian city of Pompeii, lying on the Bay of Naples in the region of Campania. Pompeii was founded about 700 years before Christ by the Oscans, a people of central Italy. (It’s difficult for us to imagine a town being in existence for hundreds of years.) Early in its history it was captured by the Etruscans. Between 525 and 474 B.C., it was captured by the Greek colony of Cumae, which was allied with Syracuse. In the 5th century B.C., the Samnites conquered it, imposing their architecture and enlarging the town. After the Samnite Wars in the 4th century B.C., Pompeii was forced to accept the status of socium of Rome and remained faithful to Rome during the Second Punic War. Pompeii took part in the war that the towns of Campania initiated against Rome, and was besieged by Roman General Lucius Cornelius Sulla in the year 89 B.C. 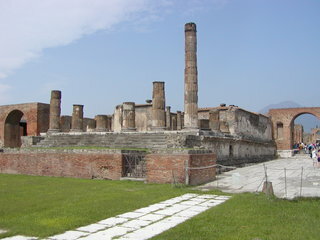 In 80 B.C., Pompeii was forced to surrender after the conquest of Nola, resulting in many of Sulla’s soldiers being given land and property and many people who went against Rome being stripped of their property. Pompeii became a Roman colony and an important passage for goods that arrived by sea. Pompeii during this time underwent a period of expansion and development. In addition to an amphitheatre being built, there were a palaestra (gymnasium) with a central swimming pool, an aqueduct that provided water for street fountains, public baths, businesses, and private houses. There were a forum, a vast food market, a sort of bar that served hot and cold drinks, restaurants, and a large hotel. For those people with the means to enjoy the amenities of the town, life must have been very pleasant. Many affluent Romans had their vacation villas there. Then, in August of 79 A.D., a tragedy of alarming proportions occurred. Mount Vesuvius erupted, destroying Pompeii and its sister town, Herculaneum. Pompeii was lost to the ages for many centuries and, when it was accidentally rediscovered and excavated in the 18th century, it provided an astonishingly rich treasure trove of artifacts. The forum, the baths, many houses and some out-of-town villas were remarkably well-preserved, due to the lack of air and moisture. A large number of well-preserved frescoes allowed the modern world a glimpse of what everyday life was like just a few decades into the Christian era. Today the site of Pompeii is one of the most interesting and popular tourist destinations in the world. Anybody who has ever been fortunate enough to visit Pompeii agrees that there is else nothing quite like it anyplace in the world.